I'm going to address today's CART problem over at The Plover Project Blog. It's a pretty simple one, and one that I've railed against for years, but I might have found some sort of workable solution for it. CART PROBLEM: Steno Machines are too expensive. This solution isn't intended to help out professionals. I own a professional machine (an Infinity Ergonomic), and I wouldn't part with it for anything. But even entry level steno machines cost over a thousand dollars, and it's seriously affecting the future of our profession. Why? Because buying one is too much of a financial risk for most people to take, especially considering the 85% average dropout rate of steno schools across the country. I firmly believe that unless it becomes as easy to dabble in steno as it is to take up any other computer-based activity (playing video games, writing software, composing music, et cetera) that the number of stenographers in this country and around the world will continue on its slow but steady trajectory downwards. Not enough people are giving it a try, and it's very hard to convince prospective CART providers, captioners, and court reporters of how fantastic our job can be when we require such a huge and non-refundable up front investment. The Plover Project is my way of giving the hobbyists, curiosity seekers, and would-be students a chance to try out this marvelous technology before they commit to it. The software is completely free, and the hardware costs only about $45, which is a much more reasonable amount for someone to lay out on a whim than $1,7500 (the sticker price of a new Stentura Protege). For more on this subject, please read my essay CART, Court, and Captioning. I've recently made a pretty useful breakthrough in my quest to produce an efficient low-cost steno machine: I discovered how to make steno-style key toppers for the $45 keyboard. They cost only pennies to produce, and they give a much more natural feel to the keyboard, making it easier for new learners to switch their muscle memory from qwerty to steno. I've actually written pretty much all of this post (except for the HTML, because I haven't gotten around to putting angle brackets into my dictionary) on the qwerty keyboard with the new key toppers, and it's really not bad at all. Want to see how it all works? Read the post! As you can see, I'm writing this at 4:00 in the morning. I did nine hours of CART today, with my first class starting at 8:00 a.m. (7:00 wake-up) and my last class ending at 9:00 p.m. I got groceries, came home around 10:30, helped make and eat dinner, sent off my daily transcripts, and then I had some medical journal transcription to do. Then I had to spend several hours trying to adjust my steno machine with my two hex wrenches to get rid of the annoying rattling noise the left hand keys had developed. It mostly worked. Then I practiced for the RMR, answered some emails, did a bit of recreational internet browsing, and now here I am, three hours before I've got to get up again. Because our work is so variable and so seasonal (summer work is especially hard to find), many CART providers try to cram as many hours into their schedules as they can in a given semester, so that they can put aside some money to live on during the slow times. But it can be tough to be out in the field for such a long stretch every day. I don't actually have a solution to this one, but I'd welcome suggestions from fellow providers and anyone else who might have ideas on how to make it easier. Other than utilizing every spare minute between classes to do the administrative stuff (like emails and transcription work), how do you manage to balance a jam-packed CART schedule with the rest of your life, including sleep, household tasks, and time for the stuff that makes all the hard work worth it? CART PROBLEM: Steno equipment can be bulky to transport from job to job. Many of my court reporting colleagues carry their equipment with them in a rolling suitcase, but since I live in Manhattan and work at three different onsite universities (plus another one remotely from my home office), I go most places via subway. It's shameful to say, but less than 20% of New York City subway stations are accessible -- that means to people in wheelchairs, parents with strollers, people with other mobility issues, and people carrying rolling suitcases. The elevators in the stations that have them are almost always terribly overcrowded, adding up to half an hour to a regular commute. I certainly didn't want to have to buy a car just to get to work (and New York City traffic is another headache entirely), so I figured that either I had to haul a giant heavy rolling suitcase up and down scads of stairs every morning (not much fun) or I had to get myself a huge, tough, ergonomically optimized backpack. I put a different power cable in each of the side pockets and strapped my tripod case to the front where the skateboard was supposed to go. It let me tell whether I had all my cables by just looking at the pockets, but it was kind of annoying to have to unstrap my tripod case every time I wanted to get into the main compartment. So last year I bought a Tamrac 5550 from a photography store, and it turned out to be a massive improvement. 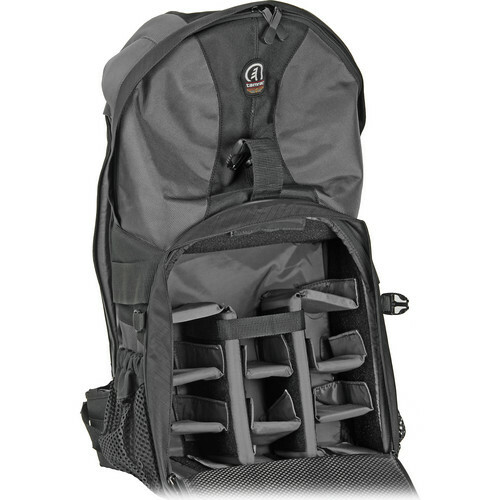 Because it's designed for professional photographers, it's got a dedicated tripod case strap at the bottom of the bag, which means no more strapping and unstrapping every time I want to open the bag. It's also got all these great partitions for each of my power cables and other accessories, so that I can tell instantly whether I've remembered to pack everything. It holds both my steno machine and my backup n-key rollover keyboard (for use with Plover), plus my laptop, my Q1 tablet, and lots of other stuff besides. * Gunmetal gray Infinity Ergonomic steno machine, on a vinyl zip case that I bought at some college bookstore. * Lenovo Thinkpad Edge laptop with typewriter decal. That's my $3,000 Eclipse dongle sticking out of one of the right-side USB ports. I've got a Bluetooth dongle in the other. * Filco Majestouch Tenkeyless n-key rollover keyboard for use with Plover. * Samsung Q1 tablet PC on its included black case. * 15-foot extension cord wrapped around homemade spool (two cable catchers with the ends snipped off and a layer of foam core in between, held together with gaffer's tape). * Kinesis Savant Elite foot pedal for transcription. * Sennheiser HD 280 Pro headphones for transcription and remote CART. * Surge protector with rotating plug head (very good for unpredictable outlet configurations in the field). * Towel tablets. So I always know where my towel is. I had five of these last week, but then a student put her wet umbrella on my chair five minutes before class started. * A pencil case to keep all this little stuff in. I make sure that the superglue dispensers are in a different pencil case from the one containing expensive stuff like my modem and my Leatherman. * My ID badge from the first time I captioned at the United Nations. I keep it as a kind of good luck charm, I guess. * My Leatherman, on top of the other pencil case. Good for last minute repairs that superglue and gaffer's tape can't handle. * My 4G USB Modem. Believe it or not, this thing is fast enough for remote CART (about 10 Mbps download, 2 Mbps upload), and it's also very useful when working on campuses that don't give their CART providers Wi-Fi access. * Expresscard to serial port converter. I basically only use this when I'm writing to LED signs or doing theater captioning. * USB to Serial converter. This is the most reliable of its kind that I've seen, but still not as reliable as Bluetooth or the Expresscard. Basically a last resort backup method. I don't carry a serial cable when I'm not doing theater captioning, so obviously I don't use this in my regular CART work. * Spray-on screen cleaner and microfiber cloth. * Tiny hex wrenches for adjusting my steno machine. * USB microphone for remote work. Not pictured: My homemade gaffer's tape spool, which is basically just a 4-inch length of plastic shelf divider with a bunch of gaffer's tape wrapped around it. It only weighs about 26 pounds, and the chest and abdomen straps keep my back from aching when I'm hiking around the city. I'm interested to hear about any other stenographers who've chosen to go the backpack route rather than the rolling suitcase route. What do you carry around and what do you leave behind? Are you able to carry at least two computers, in case one crashes? What about steno machines? Feel free to weigh in (ideally with pictures!) in the comments.